Rugged tablets are offered with an Android or Windows operating system, in multiple sizes ranging from 5â€ to 11.6â€, and can come equipped with additional features such as barcode scanning, RFID, GPS, and Magstripe Reading. Our rugged tablets can also be connected with each of the main carriers: Verizon, Sprint, and AT&T. Choose the right rugged tablet from our selection below, or call one of our representatives to request a demo or quantity discount. 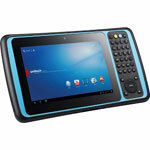 Toughpad FZ-X1, Android 4.2.2, Qualcomm APQ8064T 1.7GHz Quad Core, 5" HD 10-pt Gloved Multi-touch, 2GB, 32GB, Wi-Fi a/b/g/n/ac, Bluetooth, 4G LTE AT & T/Verizon Micro SIM Slots (Voice/Data), Webcam, 8MP Camera, NFC, 2D Bar Laser (EA30), Toughbook Preferred, Does not include AC adapter - order separately if needed. ET50, 10.1" Display, WIN 10, Intel Z3795, 4GB RAM, 64GB Flash, WLAN Only. Interface cables and charging cradle sold separately. Single slot charging cradle (Part# CRD-ET5X-1SCG1) requires power supply (Part# PWR-WGA12V60W-1WW) and AC Line Cord (Part# 23844-00-00R). Quad charging cradle (Part# CRD-ET5X-SE4CO1-01) requires power supply (Part# PWR-BGA12V108W0WW), DC line cord (Part# Cable-DC-382A1-01), and AC Line Cord (Part# 23844-00-00R). Toughpad FZ-E1, Windows Embedded 8.1 Handheld, Qualcomm MSM8974AB 2.3GHz Quad Core, 5" HD 10-pt Gloved Multi Touch, 2GB, 32GB, WiFi a/b/g/n/ac, Bluetooth, Webcam, 8MP Cam, NFC, 2D Bar Laser (SE4750), ANSI Haz Loc, Toughbook Preferred. Interface cables and charging cradle sold separately. AC Adapter (Part# CF-AA6373AM). Single slot charging cradle (Part# FZ-BCRD111). Quad slot charging cradle (Part# FZ-VEBX121M).